The original dataset consists of 122 songs MedleyDB 2.0 adds 74 new multitracks to the dataset - totaling to 196 multitracks. 108 of the original multitracks include melody annotations.The remaining 14 songs do not have a discernible melody and thus were not appropriate for melody extraction. We include these 14 songs in the dataset because of their use for other applications including instrument ID, source separation and automatic mixing. Each song in MedleyDB is available under a Creative Commons Attribution - NonCommercial - ShareAlike license, which allows the release of the audio and annotations for noncommercial purposes. The majority of these songs were recorded in professional studios and mixed by experienced engineers. MedleyDB contains songs of a variety of musical genres, and has a roughly even split between vocal and instrumental songs. The genres are based on nine generic genre labels. Note that some genres such as Singer/Songwriter, Rock and Pop are strongly dominated by vocal songs, while others such as Jazz and World/Folk are mostly instrumental. Also note that the Rap and most of the Fusion songs do not have melody annotations. A total of 105 out of the 122 songs in the dataset are full length songs, and the majority of these are between 3 and 5 minutes long. Most recordings that are under 1 minute long are excerpts and were obtained by Music Delta. These excerpts typically contain a single (complete) verse or chorus, but do not have the musical structure of a full length song. 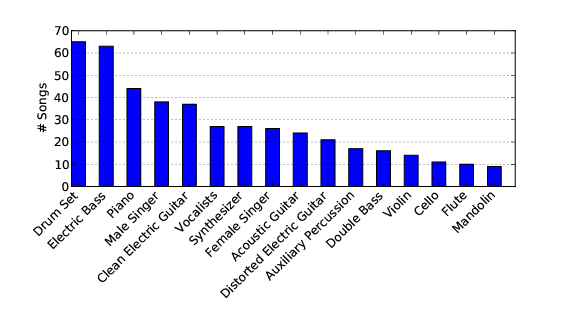 This plot shows the most represented instruments in the dataset. Unsurprisingly, drums, bass, piano, vocals and guitars dominate the distribution. This plot was generated using the instrument labels assigned to the stems of each song. MedleyDB contains a number of tracks with non-western instruments including the tabla, oud, dizi, and erhu. For the sections below, it may be helpful to download the MedleyDB sample from the Downloads page, which has the same structure as the full dataset. The dataset itself has two top level folders called "Audio" and "Annotations". Audio contains folders for each song, and Annotations contains folders for each type of annotation. The audio content includes a mix of the song, the song's "stems" (processed individual instrument tracks), and "raw" audio (unprocessed recordings). The yaml file contains the song's metadata, the "_MIX.wav" file is the track's mix, the "_RAW" folder contains the raw audio, and the "_STEMS" folder contains the stems. Three types of audio content are given for each song: a mix, stems, and raw audio. All types of audio files are .wav files with a sample rate of 44.1 kHz and a bit depth of 16. The mix and stems are stereo and the raw audio files are mono. From a hierarchical viewpoint, a mix is comprised of a set of stems, and each stem is comprised of a set of raw audio files. A stem may be created from one or multiple raw audio files. A stereo stem created from a single raw audio file incorporates any panning information. The mix is labeled in the form "ArtistName_TrackName_MIX.wav". These mixes may or may not be mastered. Unfortunately we do not have labels for which mixes are mastered and which are not. Stems are labeled in the form "ArtistName_TrackName_STEM_<stem index>.wav", where the stem indices 1 through n are assigned (in no particular order) to the n stems. Raw audio files are labeled in the form "Artist_Name_TrackName_RAW_<stem index>_<raw index>.wav", where <stem index> is the index of the corresponding stem and the raw indices 1 through m are assigned to the m raw files corresponding to that particular stem. All metadata relating to the audio files is contained in the metadata file. Raw audio is "raw" in the sense that no effects are applied to the recording (with the exception of time shifts to preserve alignment with the stems). Note that we do not consider timing adjustments to be "effects", and that the raw audio is edited in time to match the timing of the final stem (i.e. there are no events present in the raw audio that are not present in the corresponding stem). Stems contain any effects applied to the collection of raw audio files, including panning, reverb, equalization, or compression. Some songs in the dataset were recorded in a "live" group setting, and some were recorded with isolation booths. Those recorded in a group setting have bleed from other instruments in some or all of the stems and raw audio files. The presence or absence of bleed is indicated in the metadata for each song. We go into additional detail about some of these fields below. Yes indicates that the song is an excerpt (does not contain a complete song structure). No indicates that the song is a full length song. Because the notion of genre is quite subjective, we use somewhat general genre labels. These labels should not be considered to be "precise" genre labels. There are many instances where a song could have fallen in multiple genres, and the choices were made so that each genre would be as acoustically homogenous as possible. That being said, our "pop" label (for example) may be quite different than the pop label in another dataset. Yes indicates that some or all of the stems/raw audio files contain bleed from other stems. No indicates that the stems and raw audio files are well isolated. Yes indicates that the song does not contain predominant vocals. No indicates that the song contains predominant vocals. Yes does not necessarily mean there are no stems with vocals. For example, a song with for a choir that serves a harmonic purpose would be considered instrumental. The label "Dolan Studio" indicates that the song was recorded in NYU's Dolan Recording Studio. "Weathervane Music" indicates that the track was obtained from Weathervane Music's "Shaking Through" series, and were recorded in the same studio. "Music Delta" indicates that the track was given to us by Music Delta. All of the Music Delta tracks were recorded in isolation booths and thus have no bleed. The label "Independent Artist" indicates that the track was given to us by an independent artist, or in other words, "none of the above". Melody indicates that the stem contains melodic content at some point in the song. Bass indicates that the stem contains primarily bass line content. This field may also be blank, indicating that the stem contains neither melodic nor bass line content. The possible values for this label are based on this taxonomy, with the addition of the label "Main System". The label "Main System" indicates a stem representing a recording of an entire ensemble. For example, when recording classical music live, it is common to use a "main" microphone system to record the ensemble sound and also mic the instruments individually. The main system is often a primary contributor to the mix, and the individual instrument microphones are used for balance. synthesizer: a keyboard using a (melodic) sound setting that is not piano-like. The taxonomy is by no means exhaustive, and will be appended as needed for future versions. The instrument activations indicate for each stem at which time frames the instrument/voice in the stem is active. For each track the instrument activations are provided in two forms in the directory “Annotations/Instrument_Activations”. Where lambda controls the slope of the function, and theta controls the threshold of activation. Frames where instrument i is considered active are those for which C(i,t) is greater than or equal to 0.5. No manual corrections were performed on these annotations. The activation confidence annotations are given as a .lab file, and indicate the confidence values C(i,t) as described above for each stem. The rows of the lab files are in the form [time (sec), stem1_confidence, stem2_confidence, ..., stemN_confidence]. The sources are indicated in the header by their source id (e.g. S02) and corresponds with the ID's in the metadata file. The source ID annotations indicate time intervals where a particular instrument label is active. They are given as lab files where the rows are in the form [start_time (sec), end_time (sec), instrument label]. They are listed first by instrument label, and then by start time. These annotations were generated by binarizing the confidence annotations (active: confidence >= 0.5, not active: confidence < 0.5), and grouping continuous sequences of 1's into a single time range indicated by start and end time. The melody annotations provided in MedleyDB are "continuous f0" annotations. Each time frame is given a frequency value in Hz, creating pitch contours. These annotations can be found in the directory “Annotations/Melody_Annotations/”, in the folders "MELODY1", "MELODY2", and "MELODY3". Three different types of melody annotations are given based upon the definitions of melody described below. 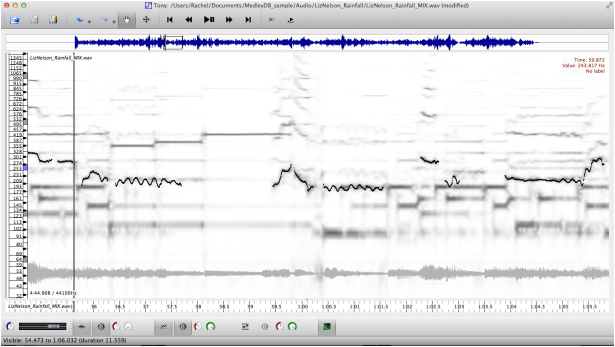 All melody annotations were generated using pitch annotations of individual stems. The pitch annotations can be found in the directory “Annotations/Pitch_Annotations”. For more information on the pitch annotations, refer to the section below titled “Pitch Annotations”. The annotations are given as comma separated files. For all 3 types of melody, the first column is the time stamp. For Melody 1 and Melody 2, the second column is the pitch value of the melody. For Melody 3, columns 2 through n are pitch annotations of each of the melodic voices, ranked by prominence. This definition of melody is the same as the definition used in MIREX, and is well suited for tracks where there is a single predominant melodic source, such as in the excerpt below. This definition ignores cases where for example, a flute and clarinet play the melody at different points in a piece. In this case, only the pitch of one of the two instruments would appear in the melody. This type of melody annotation is the pitch of the stem with the most predominant melodic source. The choice of most predominant melodic stem was made by the same annotator across the dataset. The ranking of stems by melodic prominence for each track is given in the directory “Annotations/Stem_Rankings”, with the most predominant stem labeled with rank “1”. This definition of melody works when there is one clear predominant melodic source, such as in a pop song with a clear vocal melody. However, this definition is lacking for more complex music, where multiple voices/instruments may play the melody during the course of the song. This definition applies to a wider range of music than melody 1, including cases where there are multiple equally predominant melodic sources such as in the example below where the male and female vocalists share the melody. Note that this definition still forces only one source to be "the" melody at each point in time; at the end of this excerpt where the two vocalists are in harmony, it must be decided which one is more melodic at that point. These melody intervals by stem are given in the directory “Annotations/Stem_Intervals”. For each time interval, the pitch annotation of the indicated stem is assigned to the melody. Thus, at each point in time, this type of melody annotation gives the pitch of the current most predominant melodic source. This melody annotation is the best balance between completeness of melody and simplicity (only one melodic source may be present at a time). Even so, this definition cannot capture more complicated music, where multiple sources may be playing melodic content at once. For example, contrapuntal music seldom has a single clear melody, and more commonly pop music often has two vocalists singing the melody in octaves. This definition can be applied to virtually all melodic music, and considers cases where multiple sources may be playing melodic content simultaneously. For example in the excerpt below, there are phrases where the piccolo and violins play the melody in different octaves. This definition also works for more complex interwoven melodies, such as in Bach Fugues. This definition is the most general, giving all possible melodies at a time. While comprehensive, this definition also adds considerable complexity to the problem of melody extraction, including regarding any type of training or evaluation based on this definition. This annotation is simply an ordered concatenation of the pitch annotations of the stems containing melody. The ordering of predominance is given in the directory “Annotations/Stem_Rankings”. These annotations can be plotted and sonified within Tony by loading in the corresponding mix, selecting File > Import Pitch Track…, and selecting the .csv melody annotation file. These annotations were not created as "stand-alone" annotations, but rather as a necessary first step for generating melody annotations. They are provided as part of the dataset for completeness. The pitch annotations provided are “continuous” f0 annotations. Each small time frame is given a frequency value in Hz, creating pitch contours. Note that the monophonic pitch annotations given here may not correspond to a monophonic audio source. For example, a piano which plays melodic content in addition to accompaniment will have a single pitch annotation consisting of the monophonic melodic line. The pitch annotations are given as comma separated files where column 1 is time in seconds and column 2 is pitch in Hz. The pitch was annotated only when melodic content was present. The choice of what content was “melodic” was determined by the annotators, with the rule of thumb that if they were in doubt to call it melodic. If the stem contained multiple pitches (for example a piano playing both melody and accompaniment, the predominant (monophonic) melodic line was annotated. Pitch annotations were created using Tony versions 0.5 and 0.6. Reverb tail and consonant vocal sounds were considered un-pitched. Each track was assigned to one of 5 annotators. The assigned annotator created pitch annotations for all melodic stems for the track. Once complete, these annotations were checked and possibly cleaned by a different annotator. The validated annotations are considered the final annotations. These annotations can be plotted and sonified within Tony by loading the corresponding stem, selecting File > Import Pitch Track…, and selecting the .csv pitch annotation file. These annotations indicate the predominant melodic stem for each time interval. The boundaries for each time interval occur when the primary melodic content changes voice. The annotations were created in Audacity. For consistency, one annotator created these annotations for every track in the dataset. These annotations are given as tab separated files where column 1 is interval start time, column 2 is interval end time, and column 3 is the index of the stem with the primary melodic content during that time interval. These annotations indicate the ranking of melodic predominance for each of the stems containing melody. For example, if there are n stems with melodic content, each of these stems are ranked from 1 to n from most to least predominant melody. A track with 2 melodic stems, say vocals and guitar where the vocals have the melody for all but a solo section where the guitar has a solo, vocals would be given rank 1 and guitar would be given rank 2. For consistency, one annotator labeled the rankings for every track in the dataset. These annotations are give as comma separated files where column 1 is the pitch annotation file name and column 2 is the rank. MedleyDB 2.0 brings 74 new multitrack recordings to the dataset. The new multitracks come from a variety of genres, with classical and jazz being the most dominant. MedleyDB Manager implements a collaborative ticketing system that documents the current stage of a multitrack and includes automatic email triggers when such emails are necessary in the process. MedleyDB Manager centralizes communication between all parties involved in the development of the multitrack and ensures that the status of each multitrack is documented, leading to a large decrease in data loss or miscommunication as the multitrack moves towards the final dataset. In the initial release of MedleyDB, we found that submitted multitracks often contained errors ranging from incorrect alignment of stem files to their associated mix (recall raw -> stem -> final mix structure), to silent files or data loss upon exporting multitracks from ProTools. Additionally the need to manually rename files and create a metadata file by hand presents a lot of room for user error. To address these potential errors and improve consistency and accuracy within the dataset, we created MedleyDeBugger, an application that automatically checks the submitted audio files for errors and establishes a standardized naming system. Upon completion of the error checking process, users are prompted to give information about the naming schema of their files. Finally, a folder containing the raw, stem and mix files is created. The application also reorganizes the files into a standardized structure and naming system while simultaneously creating a metadata file. We hope that the creation of MedleyDeBugger will increase consistency and accuracy of the multitracks in the dataset such that they are as clean and organized as possible for dataset users to utilize.